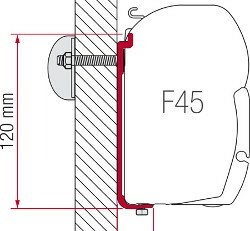 Single piece installation kit for F45 and other wall mounted Fiamma wind-out awnings available in versions to suit awnings from length 300 to 450. Adapter AS 300, 350, 400 and 450 are a single piece installation bracket to cover the full length of the awning case. Compatible with all generations of Fiamma F45 awning including F45 L and ZIP versions and also suitable for F1, F50 / F55 Pro and F50 ZIP awnings. A single, full length installation bracket for wall mounting of the awning on coachbuilt motorhome. 1 piece installation bracket avoids issues of aligning separate brackets and the long length offers greater load spreading on weaker structures.